The book provides a methodological toolbox for researchers, students and practitioners interested in better understanding innovation and improving innovation processes in service organisations. Each chapter presents a specific method, introduces its theoretical foundations, explains its practical application, and provides examples and suggestions for its implementation. The methods described include original and innovative methodological approaches, such as technology-oriented scenario analysis, experiments and laddering, as well as critical incident techniques, social network analysis, blogs, visual techniques, narratives and future workshops. 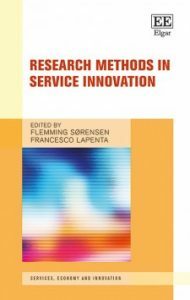 Together, the chapters encourage readers to understand service innovation research as a process that requires creative methodological thinking. The book adapts various methods and processes from different areas of research, and evaluates their strengths, limitations and possible applications in specific areas of service innovation. The book is relevant for researchers and academics, but it will also appeal to practitioners and consultants dealing with both public and private service organisations. The book is published by Edward Elgar. It is edited by Flemming Sørensen and Francesco Lapenta and includes contributions from Jon Sundbo, Lars Fuglsang, Niels Grünbaum, Anne Vorre Hansen, Anne Rørbæk Olsen, Jørgen K. Møller, Ada Scupola and Claire Forder.